The HCG Weight Loss Cure Guide by Linda Prinster is the most invaluable HCG tool one can have as they prepare for, go through, and complete the HCG Diet. It has so much important and useful HCG information, that anyone can achieve their maximum HCG weight loss with the help of this HCG book. 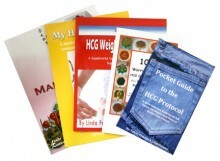 Linda Prinster begins the HCG Weight Loss Cure Guide with the goals of the HCG Diet followed by a summary of the entire HCG Diet. Then the “Getting Started” section, though short, is enormously helpful, letting you know everything you can read, do, and expect for your entire HCG round that will help you be prepared. After that, she goes into the types of HCG and how to administer them. If you haven’t decided what form of HCG you want to use, this section is very informative. Then, the HCG Weight Loss Cure Guide goes into the Very Low Calorie Diet/Phase 2 of the HCG Diet in great detail. All the ins and outs are explained from the HCG food options to the various brands of HCG Diet safe personal care products. The section titled “HCG Plateau Breakers and Daily Loss Rate Maximizers” is really enlightening. With all the combined HCG tips and tricks in this book, you can troubleshoot any HCG stall, gain, or oddity in your HCG weight loss. The HCG Maintenance Phase or Phase 3 is also explained fully. This is so useful because for most people HCG Maintenance can be the most challenging part of the HCG Diet. The information in this section will give you the direction you need to make it through HCG Phase 3 as easily as possible. Near the end of this HCG book, you’ll find the legendary HCG food list. It’s a massive list of nearly every food, beverage, and condiment that you can think of, its nutrition information, and when it is allowed (VLCD, 1st 3 weeks of Maintenance, or 2nd 3 weeks of Maintenance). The HCG food list alone is the sole reason many people survive the six weeks of Maintenance. Can I have mushrooms in the first three weeks of HCG Phase 3? Well, it depends, what kind of mushroom? Portobello? Yes. Shitake? Cautionary. The level of detail really puts your mind at ease giving you a great starting point for choosing your foods in HCG Maintenance. And finally, the book ends with a copy of Dr. Simeons’ original HCG manuscript, “Pounds and Inches Away: A New Approach to Obesity.” This document is a tough read, so once you’ve made it through the HCG Weight Loss Cure Guide, which states the same concepts so plainly, you’ll have a new appreciation for Linda Prinster’s user-friendly interpretation of Dr. Simeons’ amazing diet plan.